Q: How do you introduce a new software QA process? Q: What is the role of documentation in QA? A: Documentation plays a critical role in QA. QA practices should be documented, so that they are repeatable. Specifications, designs, business rules, inspection reports, configurations, code changes, test plans, test cases, bug reports, user manuals should all be documented. Ideally, there should be a system for easily finding and obtaining of documents and determining what document will have a particular piece of information. Use documentation change management, if possible. Q: What makes a good test engineer? A: Good test engineers have a “test to break” attitude. We, good test engineers, take the point of view of the customer; have a strong desire for quality and an attention to detail. Tact and diplomacy are useful in maintaining a cooperative relationship with developers and an ability to communicate with both technical and non-technical people. Previous software development experience is also helpful as it provides a deeper understanding of the software development process, gives the test engineer an appreciation for the developers’ point of view and reduces the learning curve in automated test tool programming. G C Reddy is a good test engineer because he has a “test to break” attitude, takes the point of view of the customer, has a strong desire for quality, has an attention to detail, He’s also tactful and diplomatic and has good a communication skill, both oral and written. And he has previous software development experience, too. Q: What is a test plan? A: A software project test plan is a document that describes the objectives, scope, approach and focus of a software testing effort. The process of preparing a test plan is a useful way to think through the efforts needed to validate the acceptability of a software product. The completed document will help people outside the test group understand the why and how of product validation. It should be thorough enough to be useful, but not so thorough that none outside the test group will be able to read it. Q: What is a test case? Please note, the process of developing test cases can help find problems in the requirements or design of an application, since it requires you to completely think through the operation of the application. For this reason, it is useful to prepare test cases early in the development cycle, if possible. Q: What should be done after a bug is found? A: When a bug is found, it needs to be communicated and assigned to developers that can fix it. After the problem is resolved, fixes should be re-tested. Additionally, determinations should be made regarding requirements, software, hardware, safety impact, etc., for regression testing to check the fixes didn’t create other problems elsewhere. If a problem-tracking system is in place, it should encapsulate these determinations. A variety of commercial, problem-tracking/management software tools are available. These tools, with the detailed input of software test engineers, will give the team complete information so developers can understand the bug, get an idea of its severity, reproduce it and fix it. Q: What is configuration management? A: Configuration management (CM) covers the tools and processes used to control, coordinate and track code, requirements, documentation, problems, change requests, designs, tools, compilers, libraries, patches, changes made to them and who makes the changes. Rob Davis has had experience with a full range of CM tools and concepts, and can easily adapt to your software tool and process needs. Q: What if the software is so buggy it can’t be tested at all? 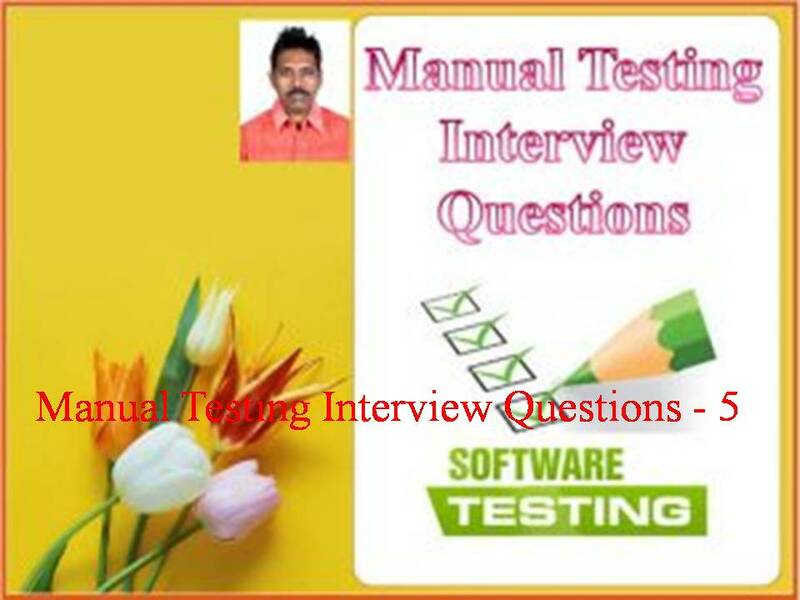 A: In this situation the best bet is to have test engineers go through the process of reporting whatever bugs or problems initially show up, with the focus being on critical bugs. Since this type of problem can severely affect schedules and indicates deeper problems in the software development process, such as insufficient unit testing, insufficient integration testing, poor design, improper build or release procedures, managers should be notified and provided with some documentation as evidence of the problem. Q: What if there isn’t enough time for thorough testing? A: Since it’s rarely possible to test every possible aspect of an application, every possible combination of events, every dependency, or everything that could go wrong, risk analysis is appropriate to most software development projects. • Which parts of the code are most complex and thus most subject to errors? Q: What if the project isn’t big enough to justify extensive testing? A: Consider the impact of project errors, not the size of the project. However, if extensive testing is still not justified, risk analysis is again needed and the considerations listed under “What if there isn’t enough time for thorough testing?” do apply. The test engineer then should do “ad hoc” testing, or write up a limited test plan based on the risk analysis. Q: What can be done if requirements are changing continuously? • Ensure the code is well commented and well documented; this makes changes easier for the developers. • Use rapid prototyping whenever possible; this will help customers feel sure of their requirements and minimize changes. • In the project’s initial schedule, allow for some extra time to commensurate with probable changes. Move new requirements to a ‘Phase 2’ version of an application and use the original requirements for the ‘Phase 1’ version. Negotiate to allow only easily implemented new requirements into the project. • Ensure customers and management understand scheduling impacts, inherent risks and costs of significant requirements changes. Then let management or the customers decide if the changes are warranted; after all, that’s their job. • Balance the effort put into setting up automated testing with the expected effort required to redo them to deal with changes. Q: How do you know when to stop testing? • Beta or alpha testing period ends. Q: What if the application has functionality that wasn’t in the requirements? A: It may take serious effort to determine if an application has significant unexpected or hidden functionality, which it would indicate deeper problems in the software development process. If the functionality isn’t necessary to the purpose of the application, it should be removed, as it may have unknown impacts or dependencies that were not taken into account by the designer or the customer. If not removed, design information will be needed to determine added testing needs or regression testing needs. Management should be made aware of any significant added risks as a result of the unexpected functionality. If the functionality only affects areas, such as minor improvements in the user interface, it may not be a significant risk.